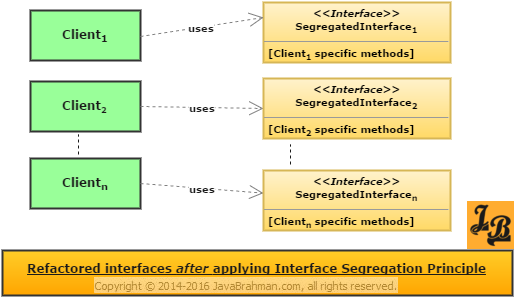 This tutorial explains the Interface Segregation Principle with example in Java. 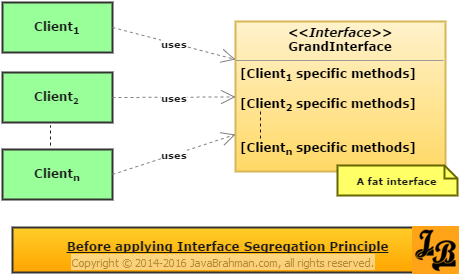 It first looks at the definition of the interface segregation principle and explains its concepts. Next, an example of a fat interface is picked for a use case in Java, it is analysed and then refactored in line with the interface segregation principle to arrive at lean interfaces. Examining the definition of Interface Segregation Principle – To understand Interface Segregation’s definition, let us assume that there is a system which has multiple functionalities and various clients using those functionalities via some interface such as a service or an API (Application Programming Interface). What the Interface Segregation Principle advocates is that instead of having a single interface catering to all the clients, i.e. holding all the methods for all the clients, it is better to have multiple interfaces with each interface containing methods for a client-specific functionality or to have functionally cohesive interfaces. The GrandInterface shown above is an ideal example of a fat interface. It contains methods specific to all the clients. The problem with this design approach is that all clients will have to unnecessarily implement all other clients’ methods just to make their interface compile. Even if, instead of implementing, the individual clients implement other client-specific methods with an UnsupportedOperationException, still its a colossal waste of time as well necessary exposure of methods and then their mandatory implementations. A fat interface is thus an object-oriented designer’s nightmare because it makes the overall design rigid due to the enormous effort required to manage changes across all clients when making a change to a functionality/method pertaining to only one client. What do we mean by client-specific lean interfaces– An important thing to note at this point is that when we mention client-specific lean interfaces, we do not really mean interfaces pertaining to each individual customer or user. What we instead mean is that each lean interface caters to a consumers of a specific type of functionality or a specific set of customers all of whom have the same functional needs. Let us look at a real-world object-oriented use case example in Java to understand how a fat interface can be refactored in to multiple lean interfaces when Interface Segregation Principle is applied to it. Let us say that there is a Restaurant interface which contains methods for accepting orders from online customers, dial-in or telephone customers and walk-in customers. It also contains methods for handling online payments (for online customers) and in-person payments (for walk-in customers as well as telephone customers when their order is delivered at home). There are 5 methods defined in RestaurantInterface which are for accepting online order, taking telephonic order, accepting orders from a walk-in customer, accepting online payment and accepting payment in person. Since the above code(OnlineClientImpl.java) is for online orders, the methods for telephonic order placement, walk-in order placement and in-person payment throw UnsupportedOperationException. Online, telephonic and walk-in clients use the RestaurantInterface implementation specific to each of them. Similar to the above OnlineClientImpl.java, the implementation classes for Telephonic client and Walk-in client will have methods which will be unsupported. Since the 5 methods are part of the RestaurantInterface, the implementation classes have to implement all 5 of them. The methods that each of the implementation classes don’t implement, they throw UnsupportedOperationException in those method implementations. As you can clearly see – implementing all methods is inefficient. Any change in any of the methods of the RestaurantInterface will be propagated to all implementation classes. Maintenance of code then starts becoming really cumbersome and regression effects of changes will keep increasing. 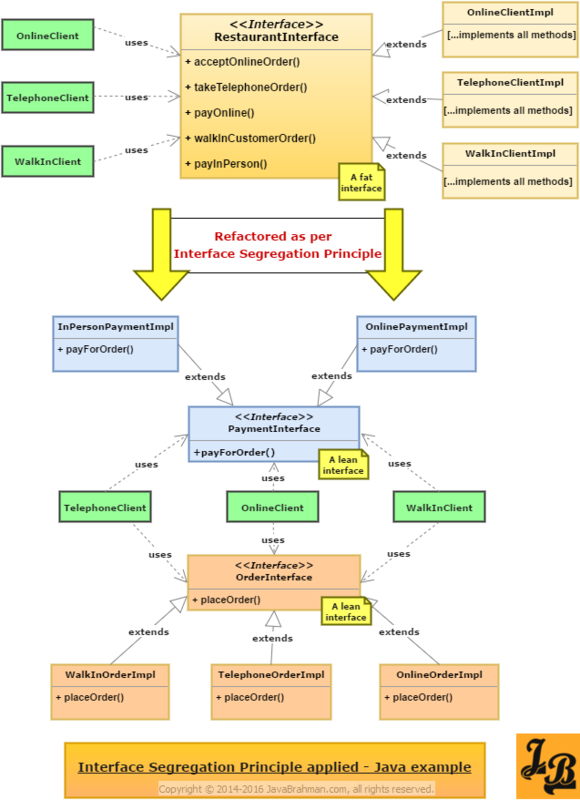 RestaurantInterface.java breaks Single Responsibility Principle (read tutorialTutorial on Single Responsibility Principle) because the logic for payments as well as that for order placement is grouped together in a single interface. Separate out payment and order placement functionalities into two separate lean interfaces. Let’s name them PaymentInterface.java and OrderInterface.java. Each of the clients use one implementation each of PaymentInterface and OrderInterface. For example – OnlineClient.java uses OnlinePaymentImpl and OnlineOrderImpl and so on. Single Responsibility Principle is now adhered to as Payment interface(PaymentInterface.java) and Ordering interface(OrderInterface) are separate and have their client-specific implementations. I.e. two separate hierarchies. Change in any one of the order or payment interfaces does not affect the other. They are independent now. There will be no need to do any dummy implementation or throw an UnsupportedOperationException as each interface has only methods it will always use. Have a look at the diagram below. It clearly shows the design before and after application of the Interface Segregation Principle. The independent class hierarchies of segregated lean interfaces of order placement and payment processing are clearly visible in different colours. Summary – In this tutorial we started off with understanding the definition of Interface Segregation Principle. We then understood the concepts behind the definition. Next, we saw the design of a restaurant use case using a fat interface and understood the problems associated with fat interfaces. Finally, we refactored the restaurant design by applying Interface Segregation Principle and then looked at how the problems in the original design were removed using lean interfaces.